izzit.org News: The Singing Revolution is Back! Last year when we offered 3,000 free copies of this powerful and inspiring full-length documentary about Estonia’s struggle for freedom, we were out within a week! 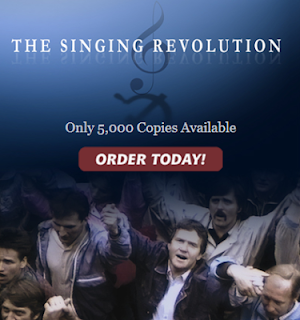 This year we’ve made a deal with the producers to offer another 5,000 copies of The Singing Revolution free to U.S. teachers. This Educational Version of the film includes 2 additional discs of bonus material with lots of primary sources and 25 teacher-created lessons plans covering history, geography, music, art, character education, and more. You can check out the Teacher's Guide and Lesson Plans here. Make sure to get over to www.izzit.org to order your copy today before we run out!